Find a Wado Kai Dojo near you! Use our handy tools to learn more about Wado Kai Dojos all over Canada! Click on a dojo to learn more about its classes and hours. Also check out our map below to quickly find the closest Wado Kai Dojo! 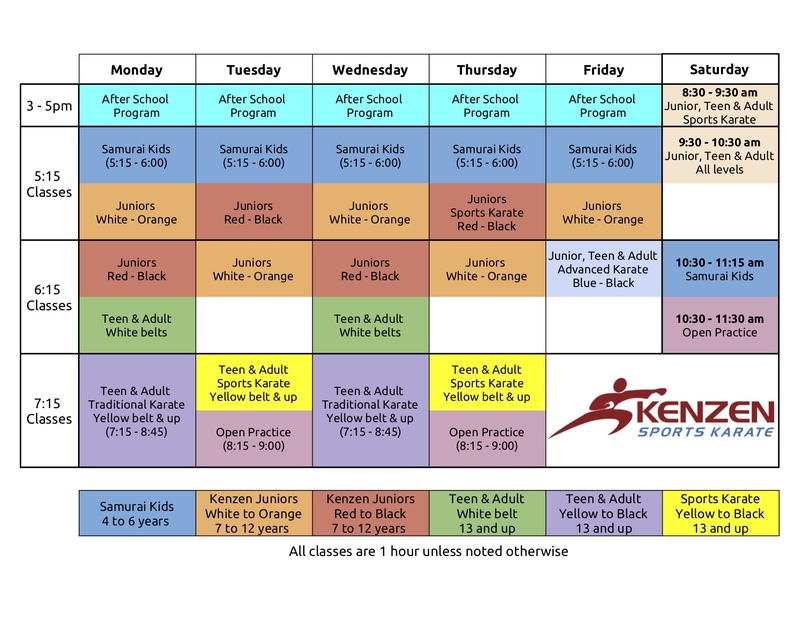 Kenzen strives to create a vibrant karate community and a safe place for our members to hone their bodies, practice their skills, and kick start their confidence. We are located in Victoria, British Columbia. Read more on our website! Our purpose built dojo features a huge matted practice area, three hanging heavy bags and a performance fitness gym. In addition, we have a large, comfortable reception lobby for parents with free wifi, while outside there is lots of free parking, all making Kenzen the perfect place for the whole family. All Kenzen instructors are certified by the Coaching Association of Canada (A Sport BC requirement for karate instructors). Kenzen is an official branch club of the JKF Wado Kai Canada Association, teaching authentic Wado Karate as in Japan. Kenzen is also a member of Karate BC, the provincial sport governing organization. Check out our schedule below. We offer classes for ages 4 to adult and special high intensity training programs for competitive athletes. Classes six days a week! Monday to Friday evenings, and Saturday mornings. Time passes quickly during youth. Knowledge and learning are not accomplished at the same rate so do not waste time. The dreams of youth, like new grass growing on the edge of a pond, must be fulfilled while fresh in the heart. The autumn wind blows a big begonia away from the stoop, creating melancholy sounds. Dojo : Hollyburn Country Club, West Vancouver Inception 1998. A non-profit organization, Karate Esprit has offered traditional karate to the Montreal West Island for over 30 years! Fall, Winter and Spring Sessions are offered each year. A Summer Session is offered based on demand and is announced during the Spring Session. December 2012 News: A 45 minute Children’s class has been added to the Winter 2013 session, Wednesday evenings, 18:45-19:30 Exams were held at the end of the Fall 2012 session. Congratulations to the following students: Jedie Hernandez and Karl Hansen (black stripe), Thomas McCaughey (orange), Craig Chin (blue). July 2012 News: Congratulations to Instructor Shahpur Ahmed on passing his 2nd degree black belt exam at the CZWKA 2012 Summer Camp in Gatineau. Quebec. June 2012 News: Karate Esprit will take a break during the month of June and return to the dojo in July for the Summer session at Latitude Fitness. MANY THANKS to Tom Motzer of Latitude Fitness for hosting Karate Esprit this summer! (www.latitudefitness.com) Exams were held at the end of the Spring session however no students advanced to the next level. Karate Esprit will be attending the 2012 Summer Camp! See you there! March 2012 News: Congratulations to Pim Sanders for passing his Brown belt exam! Annual General Meeting March 31st, 2012, 11:45am, Elm Park Chalet. December 2011 News: Congratulations! to Thomas McCaughey for passing his Yellow belt exam and to Jessie Vallee for successfully completing her first 4 months learning karate with a Black Stripe. Karate Esprit has benefited from the generosity and dedication of many instructors over the years. We thank you for your efforts and hope will you come and visit the club! 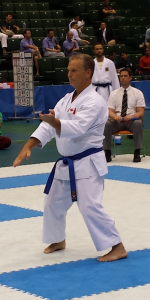 Roger Bartosh – Chief instructor in 1979 – JKF Wadokai 4th dan black belt – CKF Iaido 3rd dan black belt – Has training in Judo, Kung Fu, Tai Chi and Kick-boxing – Team captain for silver medal team at 1991 JKF Wadokai All Japan Championship in Tokyo – Represented Canada at the Wadokai World Cup in Tokyo – Has personally trained 15 students to achieve black belt level and beyond. Simon Raybould – Instructor in 1990 – JKF Wadokai 2nd dan black belt – Was captain of the Canadian Team at the 1999 Wadokai World Karatedo Cup — Has trained with noted karate experts Toru Arakawa, Hideho Takagi, Tatsuo Suzuki, Yoshiaki Ajari, Hirukazu Kanazawa, Kenzo Mabuni, and Morio Higaonna. 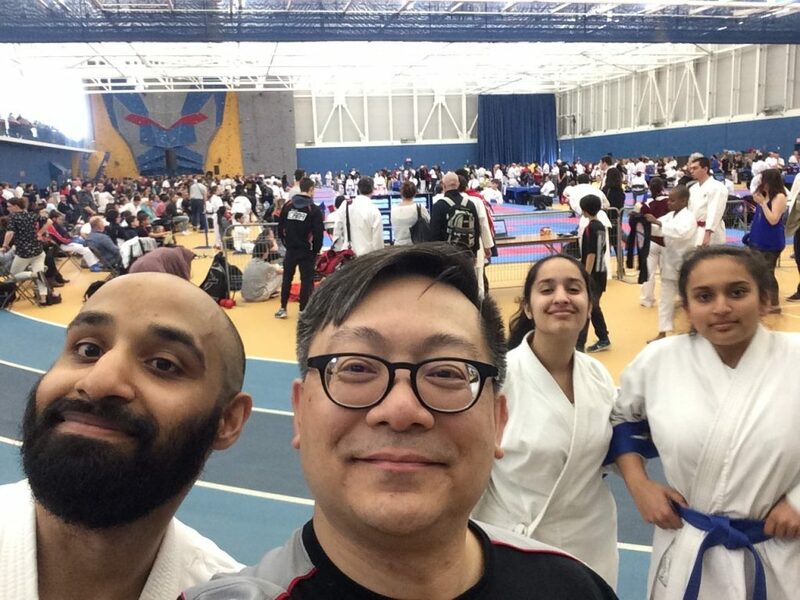 Geoffrey Sunahara – Instructor in 1999 – Wado-Ryu 3rd dan black belt – Has trained with Saikoshihan Otsuka Hironori I, Saikoshihan Otsuka Hironori II, as well as noted karate experts Tatsuo Suzuki, Masafumi Shiomitsu, and Hirokazu Matsuzaki Faiz Ahmad – Instructor since 1999 – JKF Wadokai 1st dan black belt – Practicing Wado karate for 8 years — Has trained with noted karate experts Tatsuo Suzuki and Toru Arakawa. Anthony Bhagwandin – Instructor in 1999 – JKF Wadokai 1st dan black belt – Has trained with noted karate experts Toru Arakawa and Yoshiaki Ajari. Since 2001 the Kenzen Family Karate Club has been practicing at the University of Lethbridge. Equipment: White karate gi is available through instructors. Age 8-10 AND minimum graded to 9th Kyu (white with Black Stripe). Age <8 only with the approval and recommendation of the instructors. Age 10+ AND minimum one semester as Beginner. Equipment: White karate gi, mouth guard and WKF approved gloves are available through instructors. Age <14 only with the approval and recommendation of the instructors. Saikai Wado Kai teaches the traditional style of Wado Ryu. Saikai Wado Karate Club is located East of Toronto, and is registered with the Canadian ZenKuRen Wado Karate Association (CZWKA), a member of the Japan Karate Federation (JKF) WadoKai. The CZWKA is affiliated to the JKF Wado Kai which is located in Tokyo, Japan. The Japan Karate Federation is the only organization recognized by the Japanese government to represent karate in Japan. The CZWKA, under the leadership by Sensei Norma Foster (7th Dan), is the only official Wado-Kai group recognized in Canada. Sensei Neill Hudson, head instructor has a vast amount of knowledge and experience teaching karate to people of all ages. And has a wide range of classes from teaching our Little Ninja’s from 4 – 6 years old youths 7 to 12 years old, teens, adults/parents. Neill is also First Aid/CPR certified. Sensei Neill Hudson is a Forth (Yodan) degree black belt SKW, England, and 3rd Dan JKF Wado-Kai. he has over 30 years of Wado experience. Sensei Hudson has represented England at multiple regional, national and International Championships in Kata and Kumite, countless podium finishes. European Champion 1996, British Champion 2001. Sensei Neill Hudson, has trained under some of the most respected instructors in the world. Dojo : Hollyburn Country Club, West Vancouver. Inception 1998. NOTE: Private lessons/High Performance Training available by appointment.